The Firefox Developer Tools team is particularly proud announce that Firefox 23 (in Firefox Beta, to be released today) ships with an initial but very functional Network Monitor tool that not only provides similar functionality to other tool sets, but in many improves on them. This important step is the result of lots of hard work from the entire team, but in particular Victor Porof and Mihai Sucan. Download, install and run Firefox 23 beta if you haven’t already (or Firefox Aurora or Firefox Nightly – more on Firefox and the release channels). As Firefox loads the page you’ll see each individual request get added as a row, much as you would expect from other tools. In particular it is now very easy to visualize not just how quickly parts of the page load and in what order, but also where problems are: missing assets, slow web servers, buggy apis. As you get used to using the Network Monitor, you’ll also notice that you don’t need to necessarily hit refresh on a page that is already loaded, once you open the network tool any subsequent requests that happen will be logged. For example, if you’re interested in xhr requests made by an app, just open the monitor and start clicking buttons – you should see any api calls logged as normal without needing to reload. An error such as a 404 are colored dark red to make them stand out visually from the green successful or yellow cached requests. The url is parsed out and only the file name and domain are shown. By default the load is sorted in chronological order, but you can also sort by any of the top columns, for example by domain or filename. 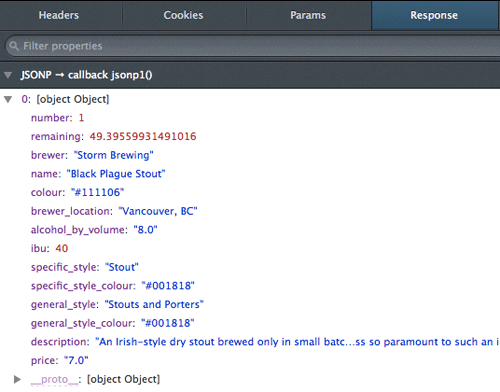 You can easily see the type of request, whether it be html content, an image or an API request. You can click on the column headers to sort requests by method, file name, domain, type or size. The Timings panel gives you a detailed, visual breakdown of where time was spent for the selected request. Is it DNS? Is it the server itself? Are you using a lot of API calls to improve the responsiveness of your app? JSON responses are parsed and displayed as a navigable object in the Response panel to make it easy to check on the data coming back from the server. You can filter the data based on JSON values as well. You can now filter requests based on the request ‘type’, including XHR, images, html. 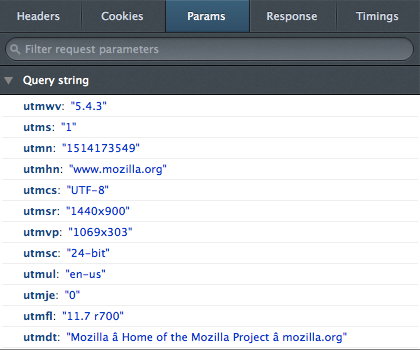 POST request parameters are supported in the Params panel. You can browse the list of requests via the Up/Down arrow keys. Many more bug fixes and refinements! Mozillian, hacker, working on Firefox DevTools. I wish they would fix the gaudy glowstick measuring sticks. In my case, firefox nightly on Ubuntu 12.04, the key to Open the Network Monitor tool is: Ctrl – Shift – Q.
Ah, interesting. Thanks for sharing. Thanks. It could be that they’re trying different shortcuts in Nightly or that they plan on using that for something else. 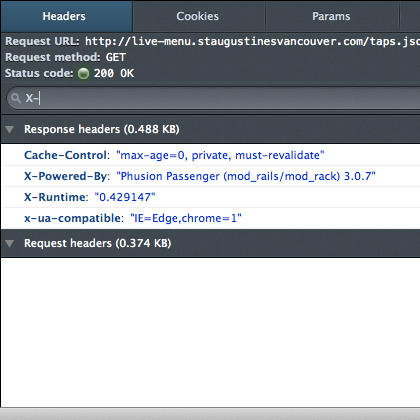 Thats fantastic feature, that i was missing in Firefox and what was a main adventage of Firebug.. Thanks a lot Mozilla! Thanks, glad ypu like it – we’re happy to be able to offer it now! What IS a main advantage of Firebug and has now been duplicated by Firefox. Coming up next, a rounder wheel. Actually, Mozilla is the proper web browser for Web Development, considering debugging tools, cache management and all other excellent features available on it. We’re glad you feel that way! When collaboratively developing, it’s super important to be able to export debugging data out of your tools. One thing both Firebug and WebKit Inspector are missing is the ability to copy the “full session” of an HTTP request, i.e. the full raw request and response. You can do this in standalone HTTP monitors like Fiddler and Charles, but the best Web browsers can do is weird stuff like HAR. I would love to be able to copy individual network requests in common formats, including full session, from the context menu. Good input, thanks for the feedback! Just a quick thought, Would it be possible to examine the Content Security Policy information being sent in the header with the original response and identify elements that do or do not fall within the approved list? 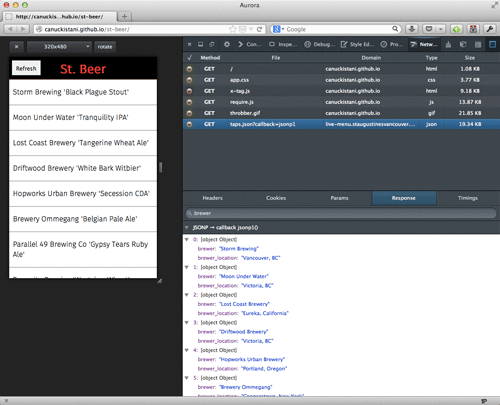 I know its possible to report back to the server but this could be handy to have in the browser as we debug. Something to consider for a future feature addition to the Network information? It’s an interesting question, and if can find a good way to do it, I definitely feel it’s worth considering. Is there a way to clear entries? To my knowledge, only a reload clears them at this time. I assume the use of this would be to more easily see XHR requests after the page has loaded? Stupid and unrelated question but is there a way to set a keyboard shortcut for the Inspect function of dev tools? Firebug as Cmd + Shift + C on Mac but I can’t find one for the dev tools. And congrats for the Network Monitor, I’ve been using it since it landed on Nightly and it’s nice, its readability could be improve though, glows are useless. Currently, the shortcuts that are available are for specific tools, and are available under Tools > Web Developer. And thanks, glad you like the Network Monitor. ctrl / cmd + shift + i brings up the inspect console in inspect mode. Just one think, thank you all Mozilla team, you are doing a great job, the last releases are so good, you are back to the right way, keep doing that. Thanks, happy to hear that! Looks awesome but still not websocket monitoring in Dev Tools? How come? It’s being planned. Please see Nick’s comment on that. I would like to see the HTTP status response per line. Currently this requires a click to see whether, for example, the page was 200 OK or 304 Not Modified. For devs who make use of browser caching, this is something useful to see at a glance. The green/yellow icons on the left represent status codes. Yellow is 3xx. Green is 2xx. Similarly, red is 4xx, pink is 1xx, blue is 5xx. I can see that, and hovering over an orb reveals the actual status code and reason, but it doesn’t help when you want to quickly glance at the responses from dozens of assets, particularly if you’re even just moderately colorblind; they’re indistinguishable to me. Hovering over or clicking on each line is not as efficient as having a clear overview of the responses. Moreover, lumping related responses together under similar colors only provides a way to approximate the type of response; hovering or clicking is still required to learn of the actual response, which is what’s useful. Thanks for the feedback. We’ll look into providing actual numbers for status codes instead of a metaphoric orb. I agree with you. Having a way to display the IP address assets came from would be nice too. The Network panel disrespects my authorotay on style choice!! I have the light theme, but Network panel is still in the dark!